MONTREAL - Canadiens GM Bob Gainey announced Tuesday the acquisition of goaltender Michael Leighton, claimed on waivers from the Philadelphia Flyers. Leighton, 25, played in four games with the Flyers this season and posted a record of 2 wins and 2 losses, a 3.69 goals-against-average and a .882 save percentage. He started the season with the Nashville Predators organization, where he played one NHL game (2 goals allowed in 20 minutes of action). 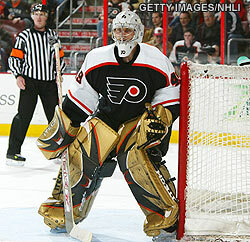 Leighton, a 6-foot-3, 186-pound goaltender, native of Petrolia, Ontario, has played in 47 NHL games with the Flyers, the Predators and the Chicago Blackhawks (2002-2004). He has posted a record of 10 wins, 23 losses, 10 ties, with a 3.04 goals-against average a .900 save percentage. He has registered three shutouts. Leighton was the Chicago Blackhawks' sixth round draft pick (165th overall) in 1999.